Nothing beats knitted wool sweaters, hats, gloves, and scarves for keeping you warm when you go on outdoor adventures. And you look great in them, too! 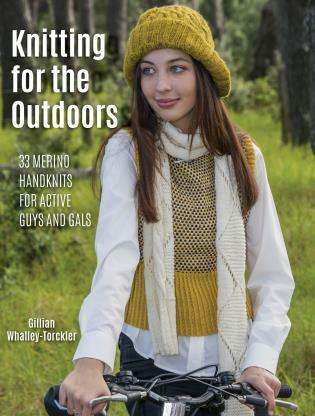 Perfect for hiking, biking, climbing, fishing--name your passion--the knits in this book are as hard-working as they are fashionable. Included are more than 30 patterns for soft, warm, light, and breathable hats, gloves, scarves, and vests for women and men, girls and boys. Every member of your family will find patterns to please with projects ranging from bright, colorful hats to muted gloves for men. Play with yarn colors for even more options. This is Gillian Whalley-Torckler’s second knitting book, but she has written 14 books in all, on diving, sea creatures, and the environment. But whatever she is doing, her needles and yarn are never far away and her love of design and the creativity of knitting come through in the gorgeous knits in this book. The photographs are by her husband, outdoor photographer Darryl Torckler. Gillian and Darryl, along with their two boys, live in New Zealand.